These beautiful earrings are from Sweet Tea Day Spa and Boutique! I purchased them about a year and half ago. I highly recommend that you follow this sweet boutique on Facebook! Valerie, the owner, always does a great job picking out awesome jewelry inventory. So, funny story about this clutch….I totally stole it from my mom and she probably doesn’t even know that I still have it. Anywho, every girl needs a simple black clutch. 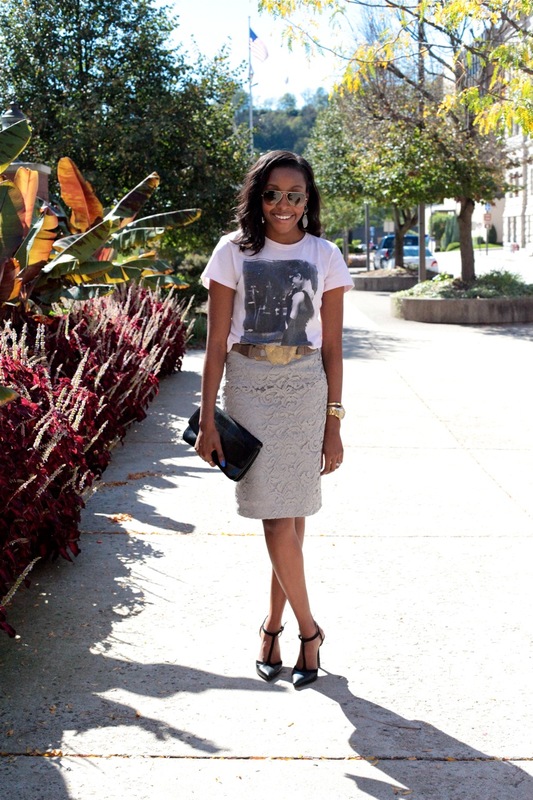 It is perfect for both dressing up and dressing down a look. 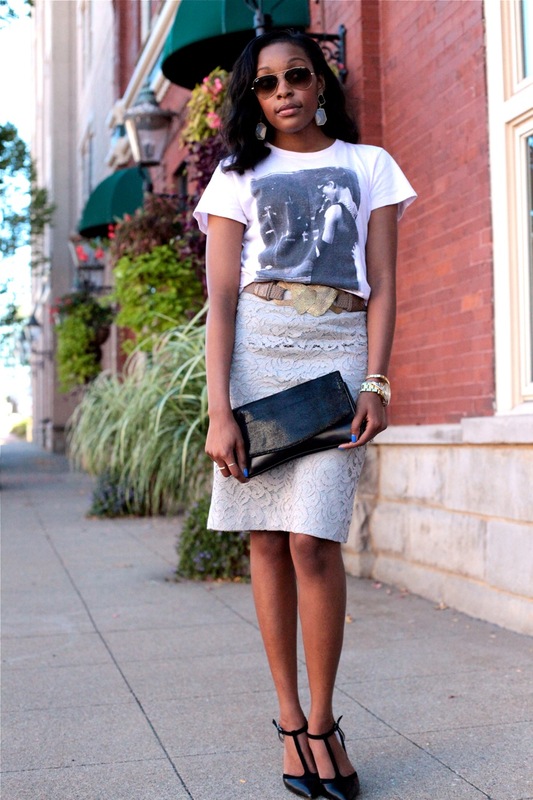 As you already know, the inspiration for this look began with the Breakfast at Tiffany’s graphic tee. When deciding what bottoms to wear with this tee, I immediately thought about jeans and immediately hated the thought! So boring and typical. lol. My mind then drifted to this gray Banana Republic skirt that I purchased for the New York City Ballet Annual Luncheon this past February. The gray is a nice compliment to the black and white screen print, and it also nicely compliments the theme of Breakfast at Tiffany’s…sophistication! From there I decided to add my BCBG black T-Straps (a TJ Maxx find for $35 bucks!) and mom’s black clutch. I mean who doesn’t love a little pale pink, slate gray and black?!? 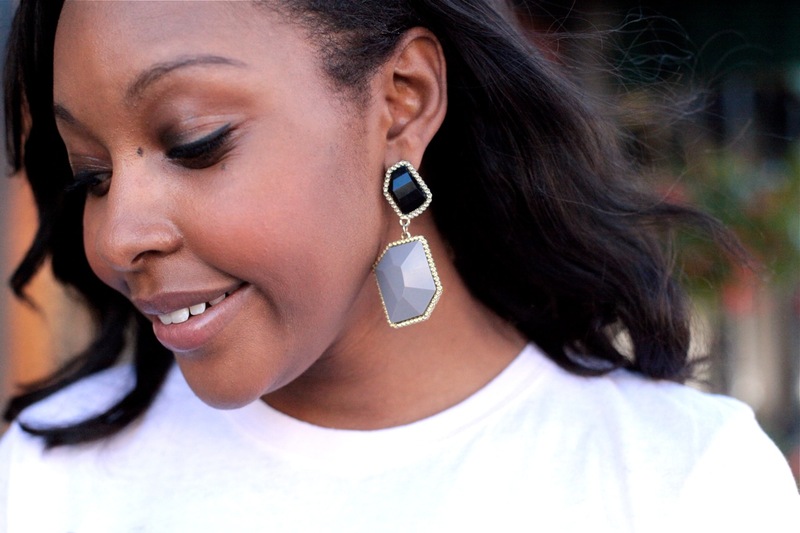 Now to bring the black and gray together, I added my favorite statement earrings from Sweet Tea Boutique! And lastly, I was inspired to add the belt based upon brass hardware from the earrings! Oh yes, how could I forget the Ray Ban aviator sunnies? A simple must have for wardrobe completion with any outfit! And there you have it folks…my version of casually sophisticated! 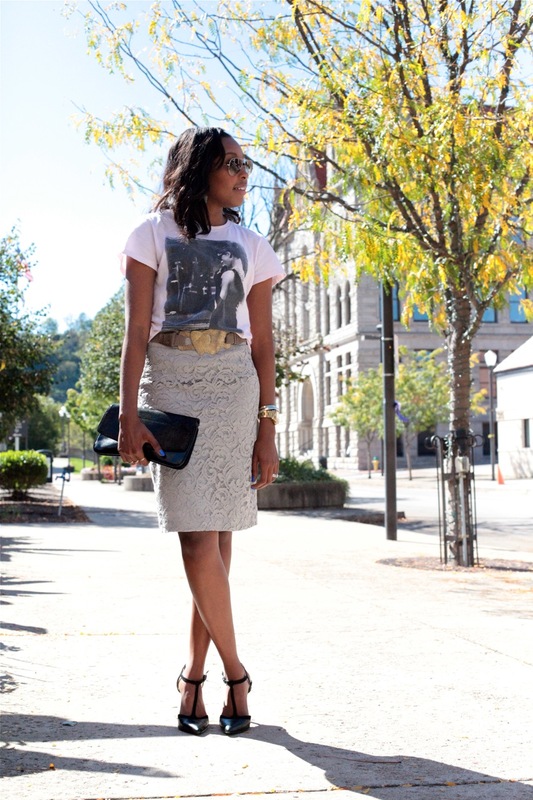 The next time you decide to wear your old school graphic tee, use the actual graphic as inspiration of how you should pair it with other pieces! Also, consider using colors on the opposite end of the color spectrum to build the look…9 times out of 10 you will create a look that is uniquely different and awesome! Right?!? I’m glad you agree 🙂 thanks for always reading, liking and commenting on everything I post!!! Means more than you know!